Desktop Virtualization provides a complete work environment. Custom configured operating system of the guest systems are stored on the host systems. We wrote about Benefits of Desktop Virtualization for Business before. This is an overview of Desktop Virtualization with Oracle VirtualBox, this is not a guide but a theoretical approach. Oracle VirtualBox is a technology developed by Innotek GmbH-platform virtualization software. The development was started in 2004 and had post-marketing authorities only as a customer. From 2007, the virtualization software was provided to users as a free software. In 2008 it was bought by Sun Microsystems, which was itself acquired by Oracle in January 2010. After the takeover, the virtualization software in Oracle VM VirtualBox is now renamed and marketed by Oracle. Oracle VM VirtualBox can be installed on different platforms such as Windows, Linux, MacOS X, FreeBSD, Solaris, and can be started as a regular application. The operating system on which VirtualBox is started, is referred to as the host system or host. VirtualBox is also known as “hosted hypervisor” or “type 2 hypervisor”. This means that VirtualBox requires the host system to create guest. There are also other virtualization products that can exist without the host system and build directly on the hardware. Such systems are also called “bare-metal” or called “type 1 hypervisor”. Since the virtual machines are running as a guest on Oracle VM VirtualBox, these virtual machines that were created on a platform that will also be recognized on any other platforms. Oracle VM VirtualBox does not require hardware virtualization, such as AMD-V or Intel VT-x, which is why the application is functional even on older hardware. Many hardware components are emulated in the host system and the virtual machine provided. It is also possible to hold the system state of the guest system in the so called snapshots, and in case if necessary its possible to restore the previously created snapshot. 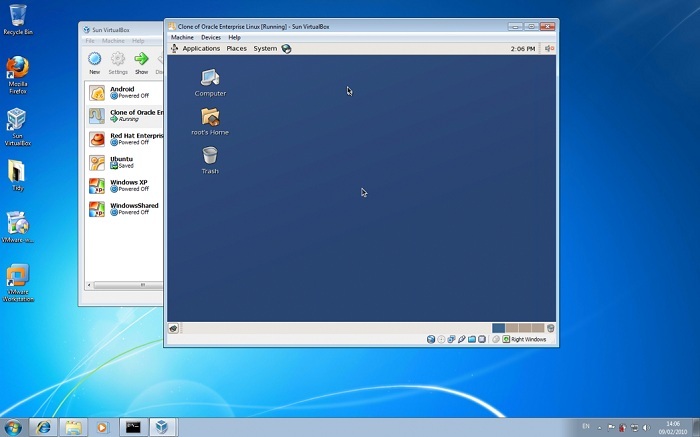 The VM can also be controlled remotely via VRDE (VirtualBox Remote Desktop Extension) that supports the RDP (Remote Desktop Protocol). So that other operating systems that do not understand the RDP, can be remotely controlled. Since version 4.0, Oracle sells a version under the GNU General Public License. This license has been published by the FSF (Free Software Foundation) and serves the licensing of free software. The offer by Oracle version is similar to the previously offered VirtualBox OSE (Open Source Edition). Additional functions, such as to be able to take the stock user application, additional software modules are integrated, which are summarized in the Oracle VM VirtualBox extension pack. This license states that the product can be installed only for private use, to test or educational purposes and used. This Article Has Been Shared 7133 Times! Cite this article as: Abhishek Ghosh, "Desktop Virtualization with Oracle VirtualBox," in The Customize Windows, September 1, 2012, April 24, 2019, https://thecustomizewindows.com/2012/09/desktop-virtualization-with-oracle-virtualbox/.